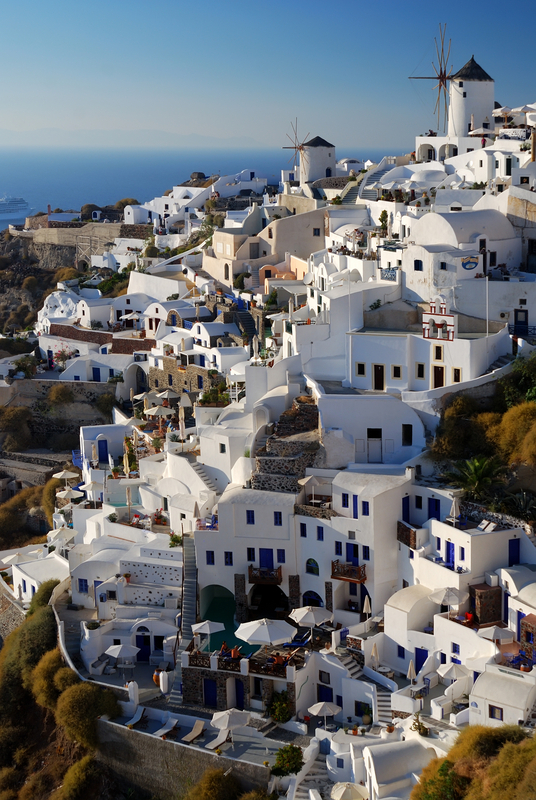 Santorini is one of Greece’s most popular islands, and as any visitor can attest, it’s easy to see why. The island has gorgeous beaches, whitewashed houses set against the hillsides, breathtaking views, an active volcano, great nightlife, wineries, and plenty of places to eat, drink, and shop. Almost every schoolchild has heard the tale if the lost city of Atlantis. Years ahead of later civilizations, the city was purported to have been filled not just with beautiful buildings, but by architecturally advanced ones. According to the ancient stories, they had heating and cooling in the houses that was made possible by hot and cold air run through the pipes they had placed in the walls. By some accounts they even had hot and cold running water. It is also said that as a civilization they were years ahead of us in laws and justice. In addition to their architectural wonders they also had art in the form of beautiful frescos. This was a dream society one that could almost not be believed. Of course no one knows for sure if it really was any of those things, because no one knows for sure if it ever existed at all. According to legend, one day Atlantis was there in all its glory, and then suddenly, it was gone. An enormous cataclysm, an earthquake and a volcanic eruption that caused giant waves, were said to have returned Atlantis to the sea. There are many theories about where Atlantis was located. 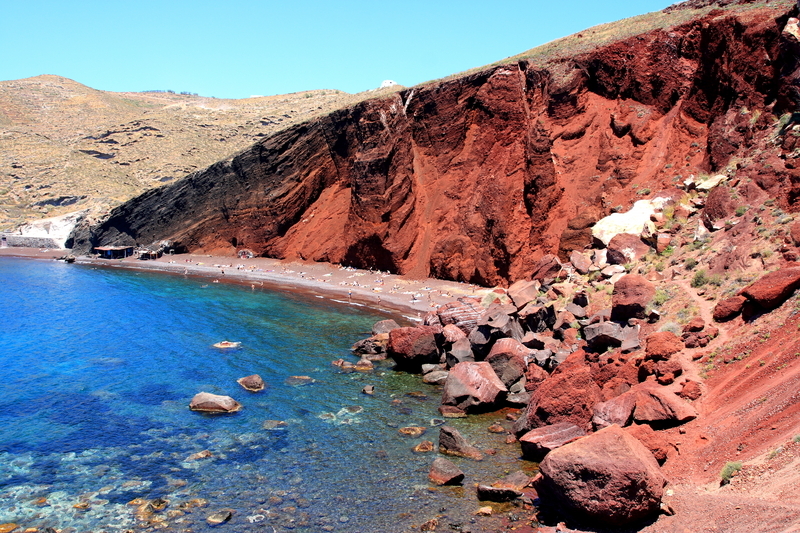 One of these is a recently discovered set of buildings buried under ash near the town of Akrotiri, Santorini. Of course recently is a relative term. In 1860 while quarrying ash for use in the Suez Canalworkers discovered the remains of an ancient town. Unlike Pompeiithere were no signs of people. The buildings looked as if their occupants had left everything neat, so it is thought that they had warning of the coming disaster and were able to escape before it swallowed the town. Perhaps it was from these people that the stories of the mythical Atlantis came. The volcanic eruption that buried Akrotiri also caused it to be forgotten. Even though it had been discovered by the workers in 1860, it was over a 100 years later in 1967 before a full scale excavation of the site was begun. This was led by Spyridon Marinatos, who was a professor at the University in Athens. The excavations continued until 2005 when a roof that had been built over the structure collapsed. One visitor was killed and several injured which caused the closure of the site and it remains closed until the roof can be repaired. As Greece is the birthplace of modern government it is not surprising there would be quite a few hoops to jump through before the reopening. 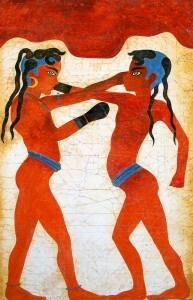 Still, you are not completely robbed of opportunities to see the wonders found at Akrotiri. Most of the frescos and many items had already been removed to the Archeological Museum of Athens before the collapse and you can still view them there. In addition, there are other places on the island where the volcano has left it’s mark. In an ironic twist, it is likely the same eruption that buried Akrotiri is also at least partly responsible for the unique beauty of the island and it’s amazing views. The wonder of the ancient world is not just seen and felt in the ruins of Akritori. 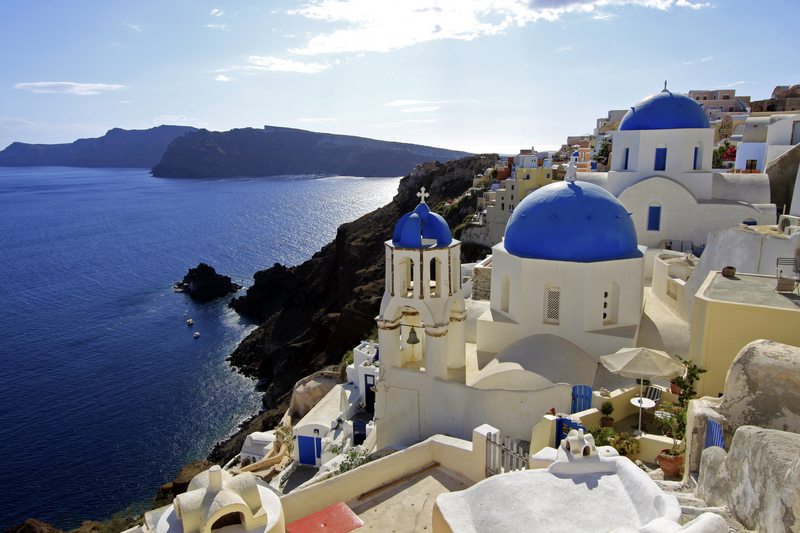 The whole island of Santorini is filled with history both modern and ancient. The past is everywhere on Santorini, it has almost a physical presence. If you listen carefully, you may even hear the voices of the ancient ones in the whispers of the wind. On the afternoon of my first day in Athens, we visited the Acropolis. Up there above the city, the warm wind whips around you and Athens is laid at your feet like a present from the ancients. On the ruins themselves a park employee sat eating her lunch; staring into space with a bored expression. For a moment I tried to imagine I had her life: one so filled with excitement that sitting on the ruins of the Acropolis bored me, but I couldn’t imagine it. 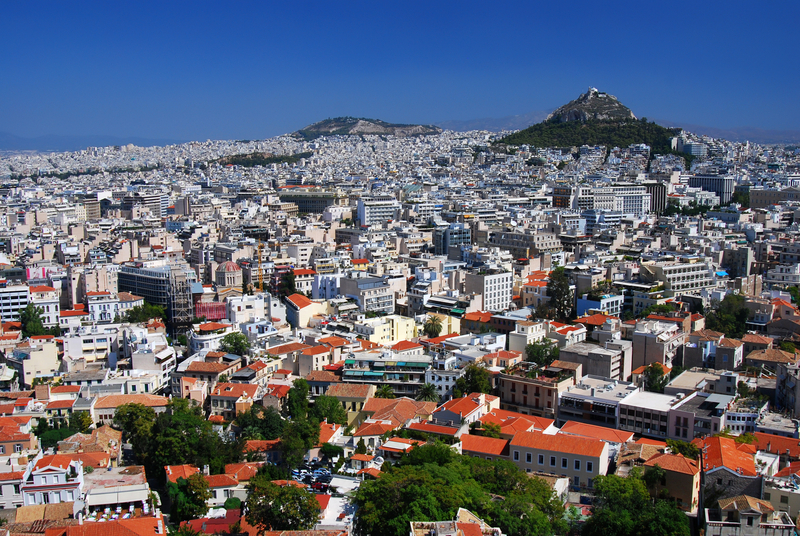 I had been blown away by Athens since the wild taxi ride that gave me my first glimpse of the city around 4a.m. that morning. Red lights had no meaning to our driver. Red, Yellow, Green, no matter… He would just lay on the horn and the gas simultaneously and keep on going. This is a different airport experience than someone headed to Athens today would likely have since my first trip to Athens was before the most recent Olympics, so their clean and shiny new airport and simple public transportation system was in the future. Instead our plane arrived on the dark deserted tarmac and had a set of stairs rolled up to us, just like in some movie from the fifties. When we did enter the airport itself, it was completely empty except for the passengers of our flight. No restaurant was open; no postcard shop. I was definitely starting to get a bit nervous that we may have to stay there until morning when I saw the line of cars painted taxi yellow through the Baggage Claim doors. We went out to the 1st car in the line and told him the name of our hotel but not much else and like taxi drivers everywhere he assured us he knew exactly where we were going- then! It wasn’t until we started hurtling down streets like one of us was in labor and the hospital was on the other side of town, that he mentioned he actually hadn’t heard of the place, but at that point wouldn’t stop to let us get the paperwork out of our luggage. Still in a short time we and way too much luggage showed up at our hotel. After a brief argument with the desk clerk we were able to convince him that we were willing to pay for the whole night even though we arrived at 4:45am. It took a few trips in the tiny elevator to get us and all our bags upstairs to a room that looked nothing like the pictures online had. I knew I was near a panic. I had been traveling for at 38 hours and I was in a hotel in a country I knew nothing about, as far away from the world I knew as I had ever been. I walked across the room, opened the bamboo doors and stepped out onto the balcony. The view took my breath away. 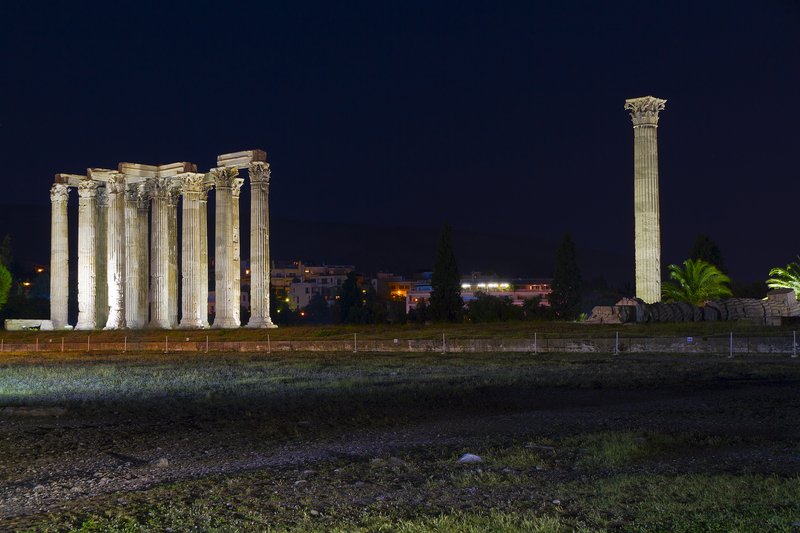 There in front of me lit only by moonlight was the Temple of Zeus. All the panic slid away and I felt a sense of peace, I had arrived. I took a few moments every night to examine that view no matter how late I came in and it always gave me that same sense of wonder. And this was only minor ruins. So how I could I ever be bored by the Acropolis? I spent less than 12 hours on Santorini and yet it still feels as though it is a place burned into my soul. From the moment I stepped off the launch I thought to myself ‘I could live here’. There was some sense of coming home as though it was where I was supposed to be. Of course, that may have had something to do with the fact I didn’t have to take a mule up or walk the 580 steps from the harbor where the ships usually drop visitors. Since I was going to Akrotiri the archeological site some say might be the mythical Atlantis. I was dropped off elsewhere on the island and was whisked onto an air conditioned bus. 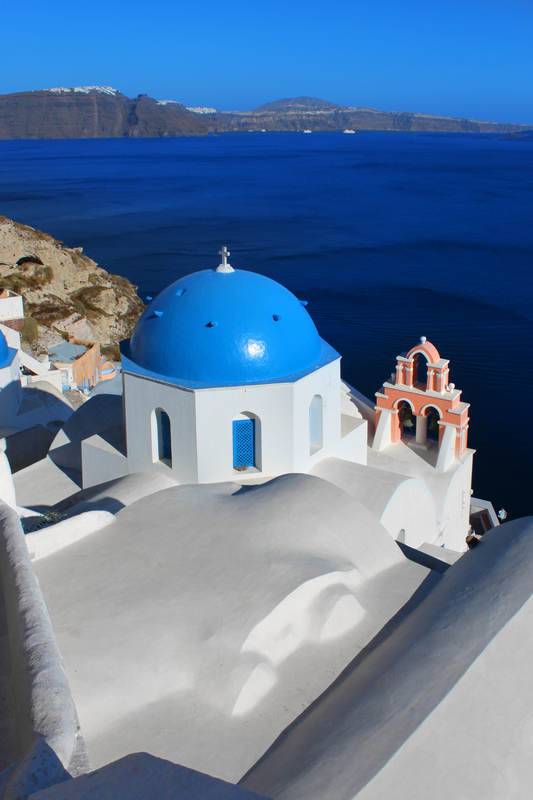 Santorini and all the Greek Islands are home to some of the most beautiful architecture I’ve ever seen. The bright blue domes on the white churches and other buildings make them appear at once stark while still exuding a sense of calm. I’ve tried to find out how many churches there are on Santorini, but the closest I can come is that it’s been said there are more churches on Santorini than there are days of the year. I also read somewhere that some of the churches are only opened on the Saint’s feast day. Back then and I must admit age hasn’t made me any more realistic; I longed to live on the island. Just to set up a home and to see what life is like there. Maybe that’s just the dreamer talking, but I like and admirer the dreamer in me who believes in what she wants rather than finding a million reasons why it wouldn’t work. Oh to give the dreamer free rein and hold back the worrier for once. To go back to beautiful Santorini and get a home for six months. Something cheap but hopefully still with a view of the caldera and spend my days traipsing back and forth across the island counting and taking pictures of all those churches. Finding out why and when they were built, what was their history, how could such a small island support so many churches? When did they stop being needed these churches what about the Saint were they named to honor? I promise myself this one day. I will take that journey. Of course the worrier insists that would be a huge mistake. Still what would life be like if the dreamer ruled and the worrier only handled things like online banking? I think it may be just about time for me to find out.